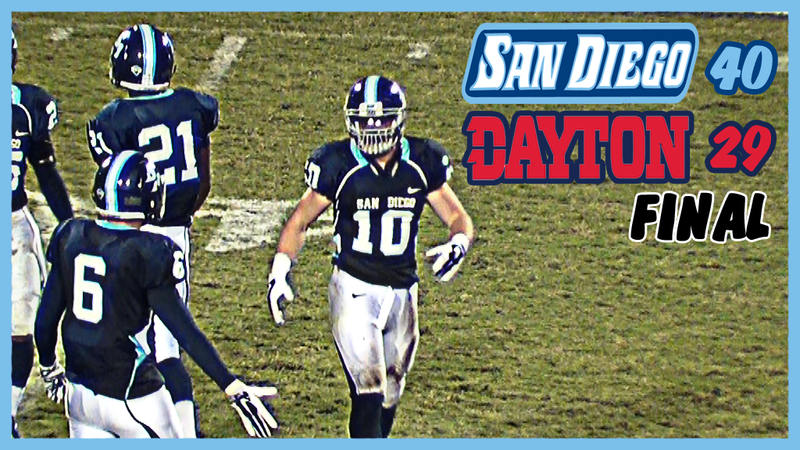 TORERO STADIUM (10/25/2014) Junior running back Dallas Kessman ran for 102 yards and two touchdowns as the University of San Diego Toreros (6-1, 4-1 PFL) came away with a 40-29 win in a hard-fought Pioneer Football League contest with the Dayton Flyers (5-2, 3-1 PFL). Down 29-26 facing 3rd and 4 on Dayton's 25-yard line, Keith Williams found freshman tight end Zach Holland for a 24-yard completion that nearly reached the endzone. The play set up a one-yard end zone dive by fullback Chris Campano to give the Toreros a 33-29 lead with 2:01 left to play. Dayton's final shot to win the game fell short after Will Barto's pass was picked off by linebacker/safety Troy McCleland and returned for 27 yards. Williams went on to seal the Toreros' fifth straight win with a 13-yard quarterback keeper for the game-clinching touchdown. A rough start for the Torero offense led to five consecutive punts, including one that was blocked and recovered in the end zone, giving the Flyers a 13-0 lead early in the second quarter. The offensive struggle continued for the Toreros on the first play of the following drive. A 27-yard pass from Williams to Brandon White was fumbled and recovered by Dayton linebacker Chris Beaschler. The Flyers managed to reach USD's three-yard line, but the Torero defense held them to a field goal attempt that missed wide left. The Toreros capitalized with an 80-yard drive that ended with a 17-yard touchdown pass from Williams to White, cutting Dayton's lead to 13-7 with 2:41 left in the half. On the ensuing kickoff, the Toreros regained possession after a forced fumble by kicker David Last was recovered by Jereke Armstrong on Dayton's 36-yard line. 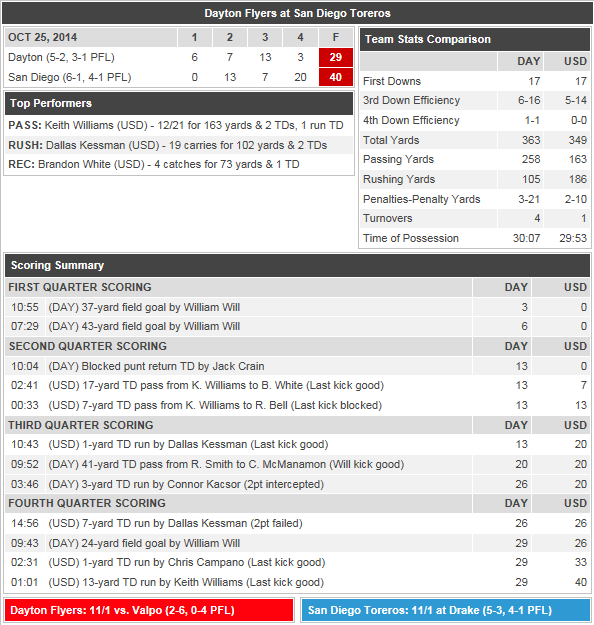 The Toreros capitalized again, this time with a seven-yard touchdown pass from Williams to Reggie Bell. A blocked extra point kept the score tied 13-13. An interception by linebacker Una Hamala gave USD another opportunity to take the lead going into halftime, but the Toreros failed to score as time expired. After a one-yard run by Kessman gave the Toreros their first lead of the game, Dayton struck back with 13 unanswered points to take a 26-20 lead going into the fourth quarter. The Toreros went on to outscore Dayton 20-3 to close out the game.